Palm Springs, CA – February 12, 2011 – Saturday’s California Winter League action gave fans plenty to wag their tails about, as the Palm Springs Chill hosted the Coachella Valley Snowbirds in the opening game. It was “Bark in the Park Day” at the stadium, with both the fans and their dogs being treated to great baseball action. Chill leadoff batter Alex Cowart, who has been on an offensive tear as of late, deposited the first pitch he saw over the left field wall for a homerun. 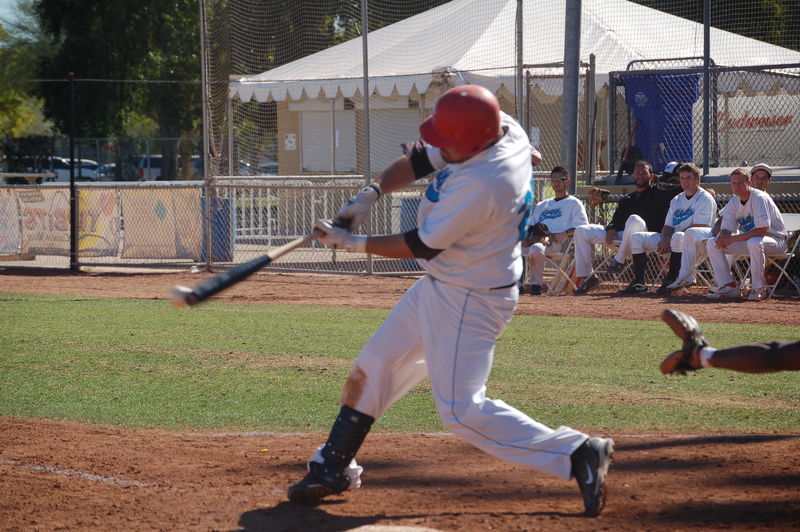 Chris Round doubled and scored on a Nick Spears sacrifice fly to give Palm Springs the early 2-0 advantage. The Snowbirds answered with two of their own in the third, on an RBI-groundout by Takeru Kawada and an RBI-single by Walter-John McGowan. But Palm Springs quickly reclaimed the lead in the bottom half of the inning. Mike Olsen’s 2-RBI single and the second sacrifice fly of the game for Spears gave the team a 5-3 lead. They added another run in the fourth on a Cowart RBI which scored Chad Bisnette. Coachella Valley made it interesting, scoring two in the seventh on a monster home run by Adrian Martinez and one in the eighth on a Tyler Liffrig RBI –single, bringing them to within one of the Chill. Their bullpen, however, eradicated any hope of a comeback as Takinori Koshigoe struggled with his command. He surrendered three runs and recorded just one out and the Chill came out on top with the 9-5 victory. The decisions went to both starters, as Mike Jackson Jr. (2-1) got the win over Robbie Nelson (1-1). Game Two was a fierce matchup of the top two teams in the CWL. The Palm Desert Coyotes and the Canada A’s had identical 8-6 records going into action, both aware that the winner would take sole possession of first place heading into the final week of the season. Right-hander Matt Walker started for the A’s and lefty Kevin Crimmel got the nod for the Coyotes. Walker was tagged first in the top of the third, as Trivon Howard scored on a sacrifice fly by Nate Wilson-Traisman. They added another run in the fourth on a Jordan Drake RBI-double that plated Marcus Dennistoun. Canada put up a three-spot in the bottom of the inning on a single by Sam Wiley, a double by Brian Ivan and RBI’s from J.T. Putt, Beau Brett and James Decesare. The Coyotes tied it in the fifth when Brauncy Jenkins crossed home on an groundout by Howard. But the deadlock was short-lived, as A’s shortstop Brian Bistagne doubled and scored on a Garrett Smith single in the bottom of the inning to give Canada a 4-3 lead. The team in red never looked back. They added three in the sixth, highlighted by a Drew Taddia RBI single and a 2-RBI double by Harry Williams, plus three more in the eighth on an RBI-single by Mark Hill and a 2-RBI double by Brett Flowers. Walker (2-0) struck out six and walked two, giving up only one earned run in seven innings to earn the victory. Crimmel (2-1) went 5.1 innings before giving way, losing his first game of the season. On Sunday, the first place Canada A’s (9-6) take on the Coachella Valley Snowbirds (7-7-1) at 10 a.m., followed by the Palm Springs Chill (5-9-1) hosting the Palm Desert Coyotes (8-7) in the 1 p.m. matchup. All CWL games can be heard live on www.CaliforniaWinterLeague.com, with select games simulcast locally on NewsTalk 920 KPSI. Games are played at historic Palm Springs Stadium, located at 1901 E. Baristo Road in Palm Springs. 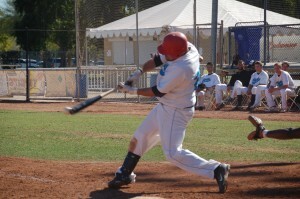 Palm Springs Chill first-baseman Mike Olsen drives in two with a single in the third inning on Saturday.